The original text which may have been changed in the meantime was: "Wie der Fotograf vermerkte, gelang ihm diese Aufnahme um 7.53 Uhr mit der 89 X 85 der Pennsylvania RR Company bei Attica/Ohio an der Bahnstrecke zwischen Cleveland/Ohio und Fort Wayne/Indiana. (05.08.1955) Foto: R.R. Malinoski"
I'd think we're seeing a B&O freight possibly near Attica Junction. Could anybody shed some light on this, please? Well, it looks plausible, western ohio is relatively flat farm country formed by the glaciers thousands of years ago. 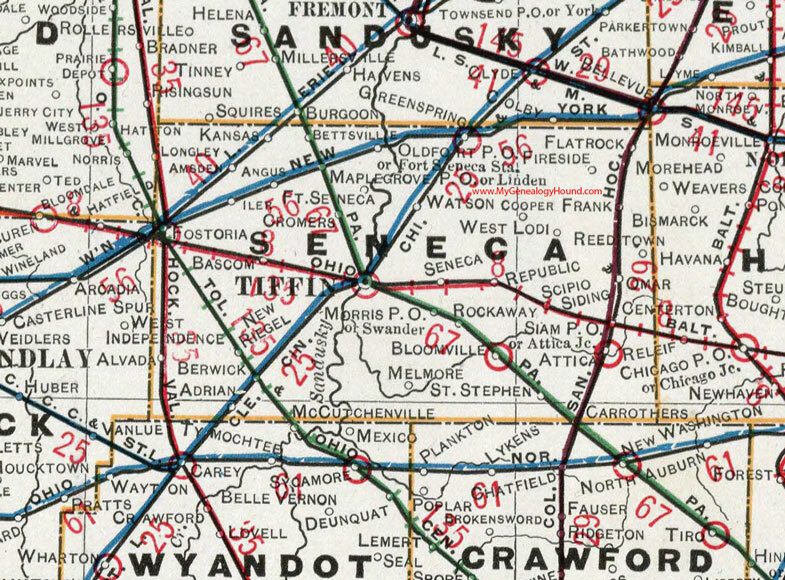 Here's the B&O system map but it doesn't show either Attica or even Fort Wayne. 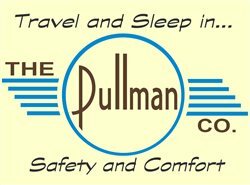 No idea if the line still existed in the 50's. Seems awfully familiar to this 9-18-1955 photo by Bob Withers and the caption states that this T-3b, 5565, is on westbound #97 at Attica Jct. Ohio. If the photo is in the morning and he's eastbound, there must be a grade here, note the sand accumulation on the rails. I thought I had a track chart of this area but I can't put my finger on it at the moment. Mr. Withers' photo shows a westbound, the pole line would be on the south side which would agree with the OP's photo. There could be sidings on both sides of the two-track main, obscured in the photos by the height of the main track. This basic chart indeed shows a stiff grade on either side of Attica Jct. 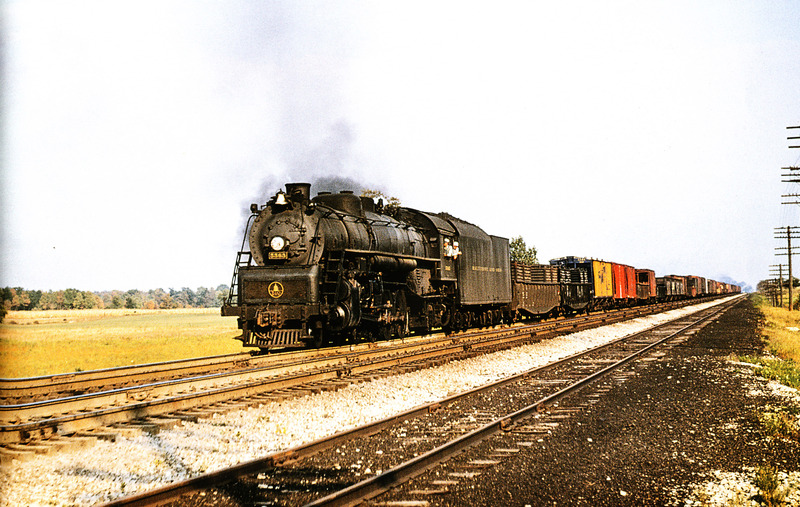 PRR's Columbus-Sandusky line famously crossed the B&O mainline at Attica Junction. 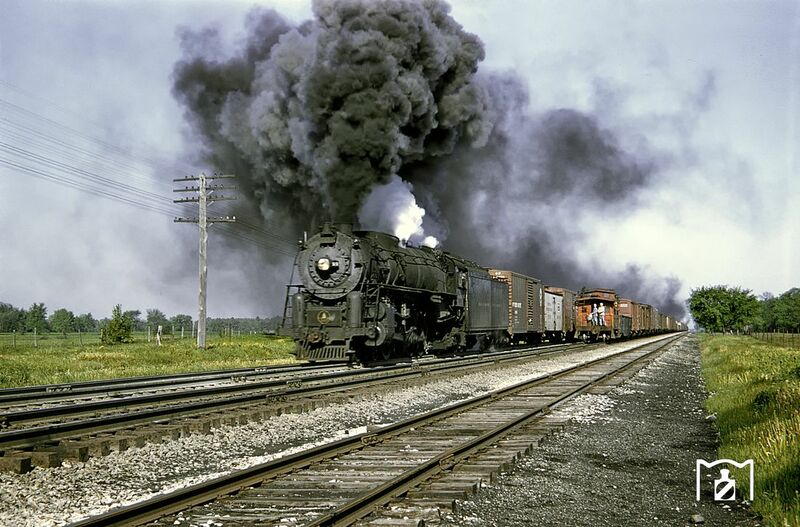 It was big with steam fans, as the PRR 2-10-4s lasted there a long time. 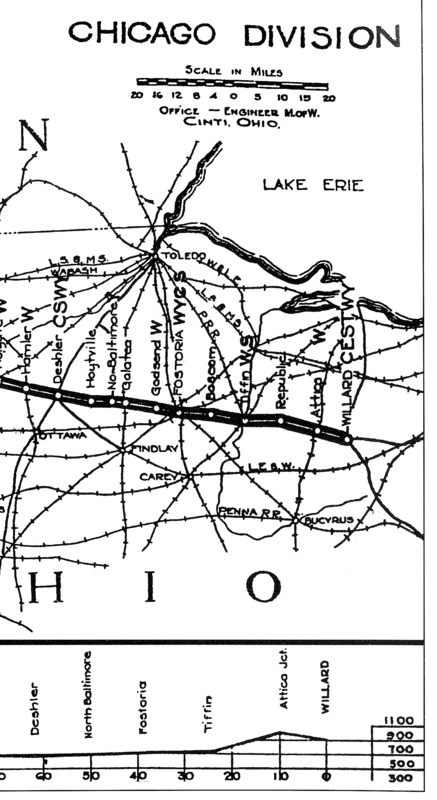 The line mainly carried coal off the N&W to the lake port. Eventually the line was sold to the N&W. To me the photo looks like the 2 trains are on double track. Wasn't the B&O main double tracked in the area west of Willard? B&O's 'prefered' method of Main Line operation was double track with current of traffic signalling and directional passing sidings. Yes, A dozen oil-burning Santa Fe 5011-class 2-10-4's were leased to Pennsy between late April and early December 1956 to haul coal between Columbus and Sandusky, OH. It was just a few years after they scraped their 26 Q2 class 4-4-6-4. Referred to as Republic Hill - it was the ruling grade between Willard and Chicago 0.30%. Not much of a grade in real terms, however, when you load locomtives to the maximum tonnage for the territory, any deviation from level or descending can be quite a struggle. More than one train stalled on Republic Hill. I suspect with today's trains being well in excess of a mile in length, the momentum of their length makes Republic Hill less daunting to today's engineers.